A long period of painstaking work by club staff and volunteers comes to fruition on Friday, October 16 when current and former ‘Fax players attending the Halifax RL Players Association annual dinner at Bertie’s in Elland, receive heritage certificates. Each certificate features the player’s name, debut season and a unique number stating their order of appearance amongst the almost 1,350 players who have worn the blue and white Halifax shirt since the Northern Union began all the way back in 1895. “Whilst the players association has an extensive database, the club is hoping relatives of players no longer with us will get in touch to claim their certificates,” said club historian Andrew Hardcastle. “We’re sure they’ll be very proud to have a physical reminder of the service their loved one gave to the club,” Andrew added. The success story of an otherwise forgettable season for the club has been the new reserve team. Despite a lack of regular matches after other Championship Clubs ditched their sides mid-season, ‘Fax persevered, with five local players starting out in the reserves going on to make first team debuts. The Independent Supporters Trust raised over £21,000 to help fund the team, which made the difference between having the side and not. The Trust thanked sponsors by having the players present mementos of the season at a barbecue following the club’s final match of 2017. 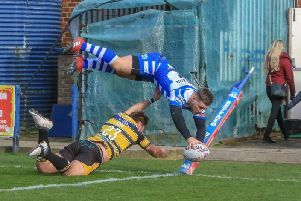 2017 came early for Halifax RLFC season ticket holders as they snapped up early bird offers on membership for the new season set to begin in February.